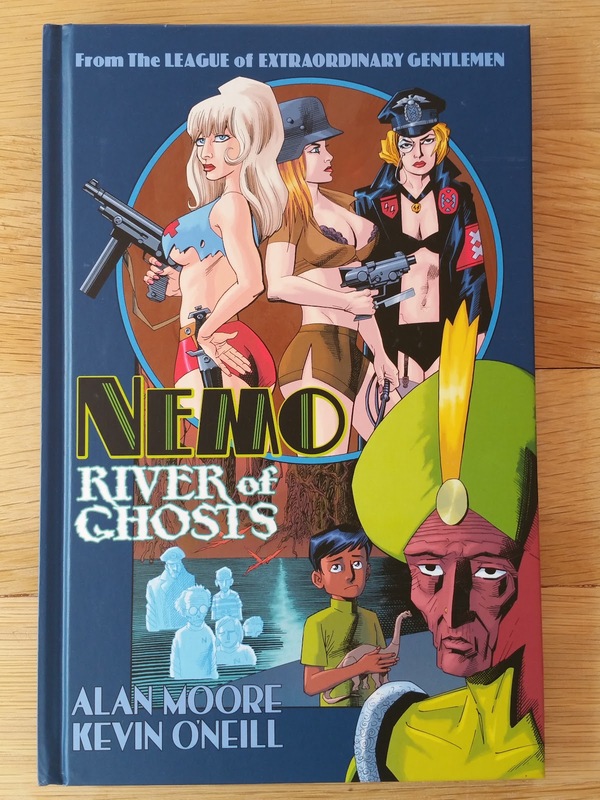 Script Alan Moore, art Kevin O'Neill. 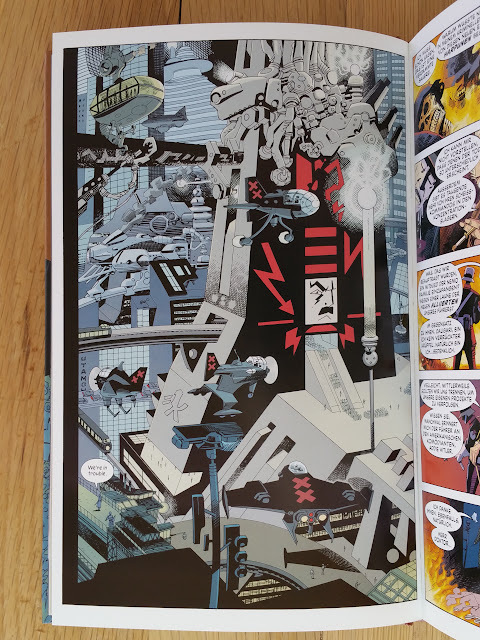 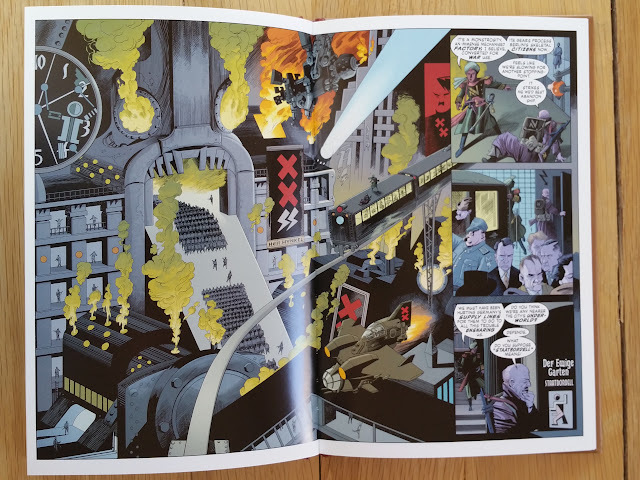 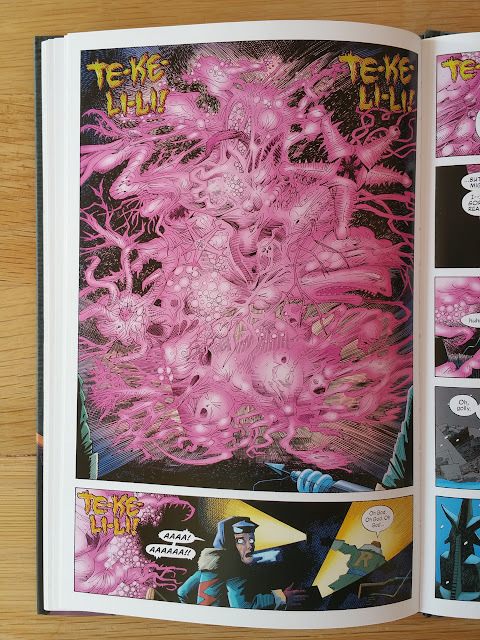 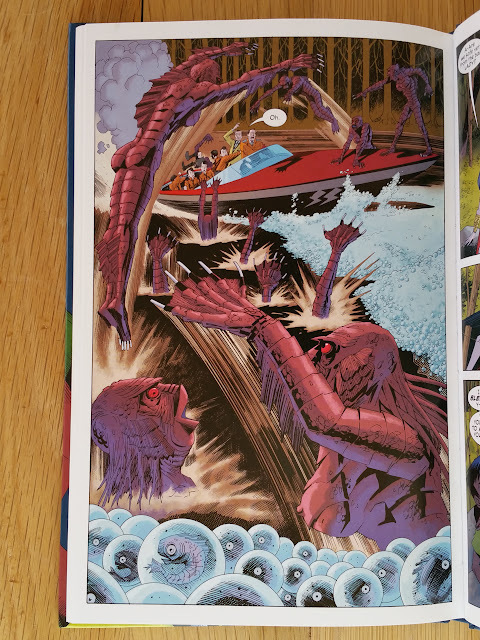 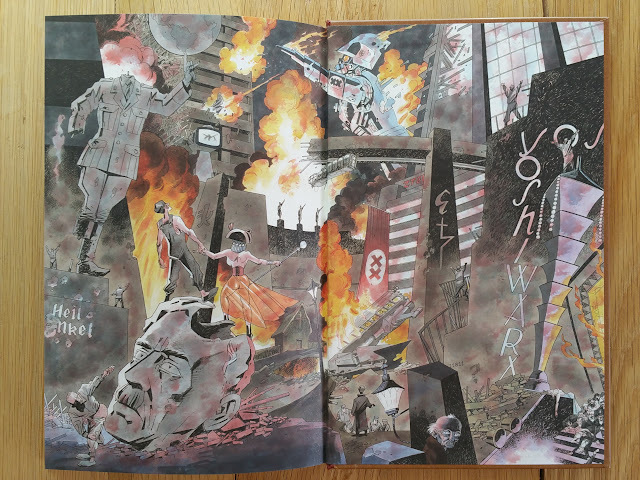 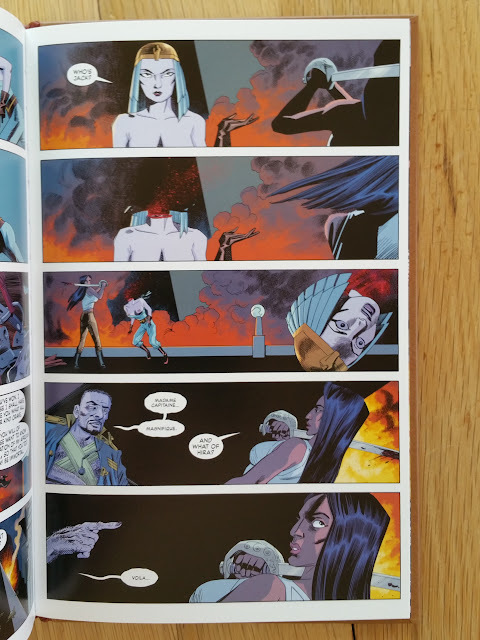 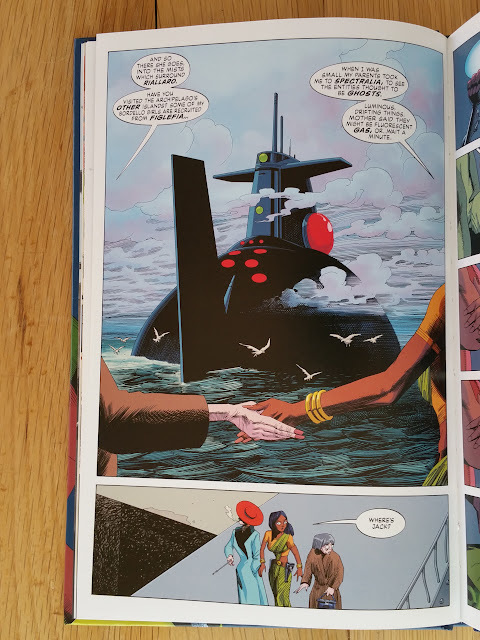 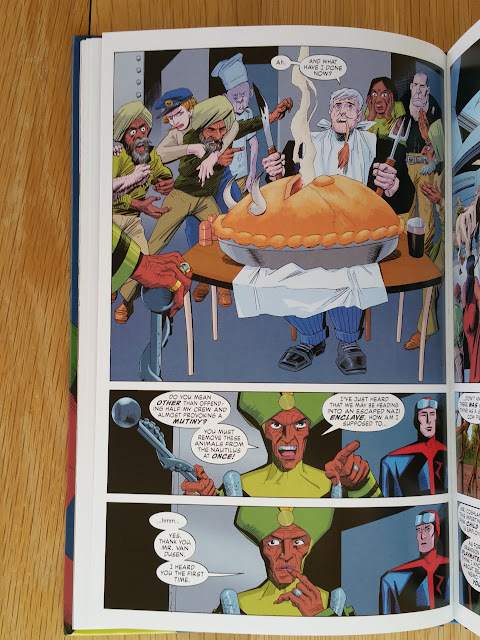 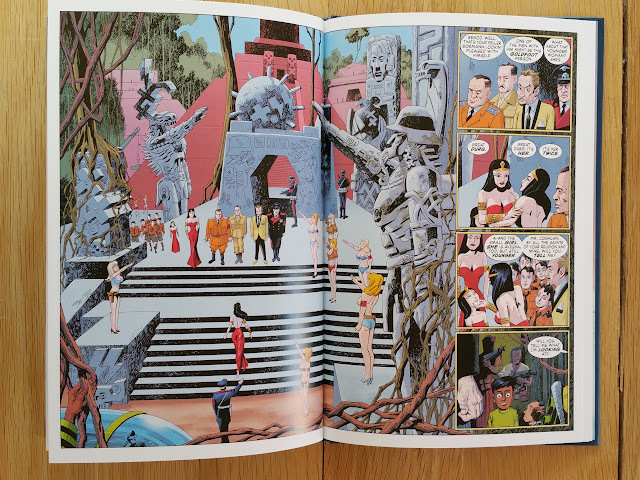 All material is ©Alan Moore and Kevin O'Neill. 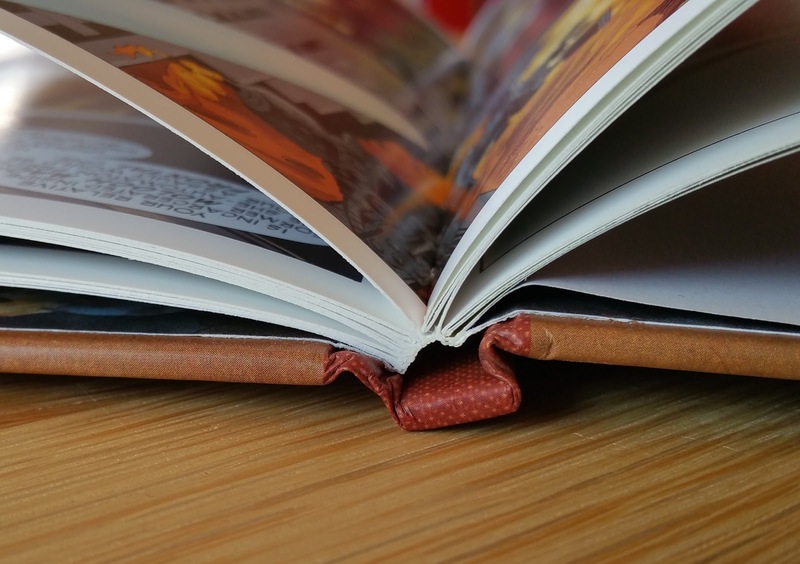 For a complete list of all books reviewed in this blog, please visit the index page. 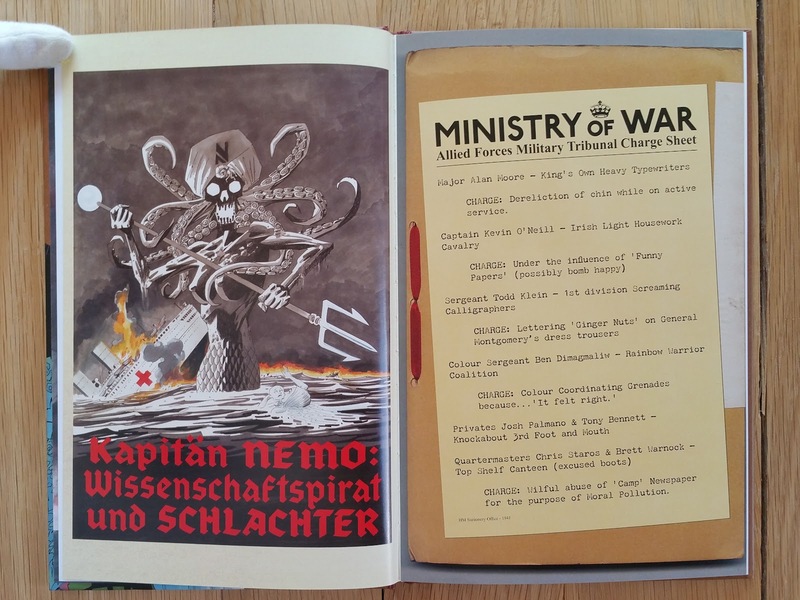 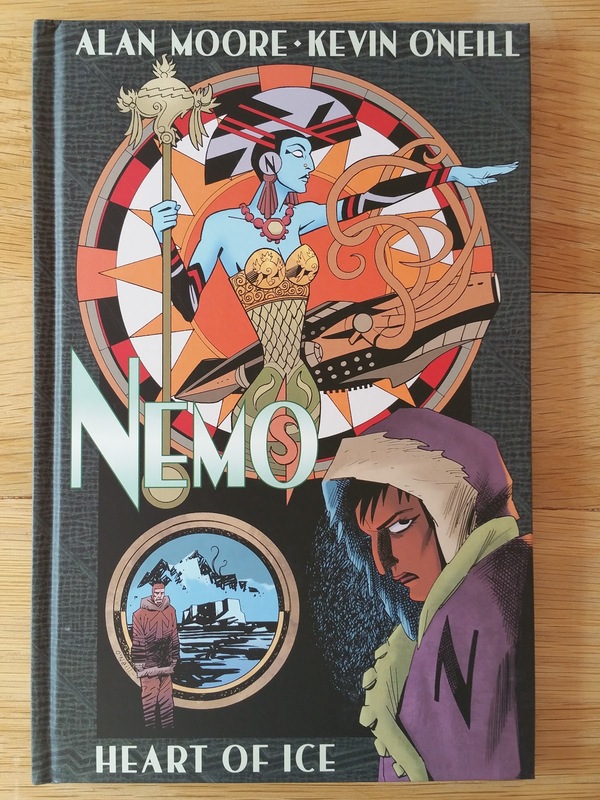 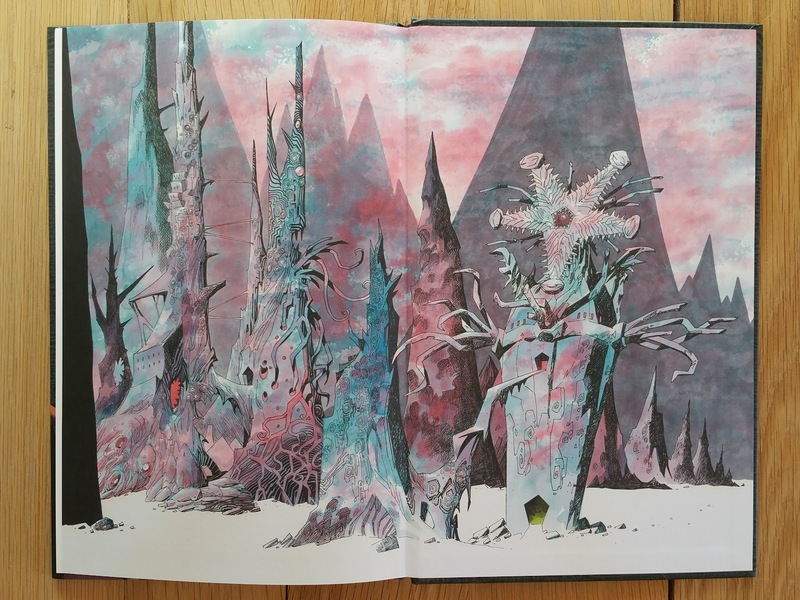 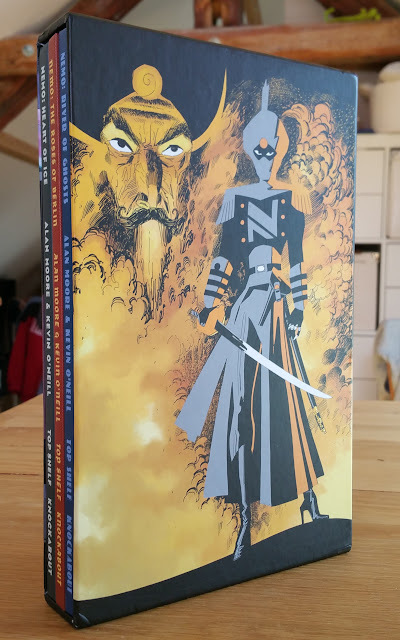 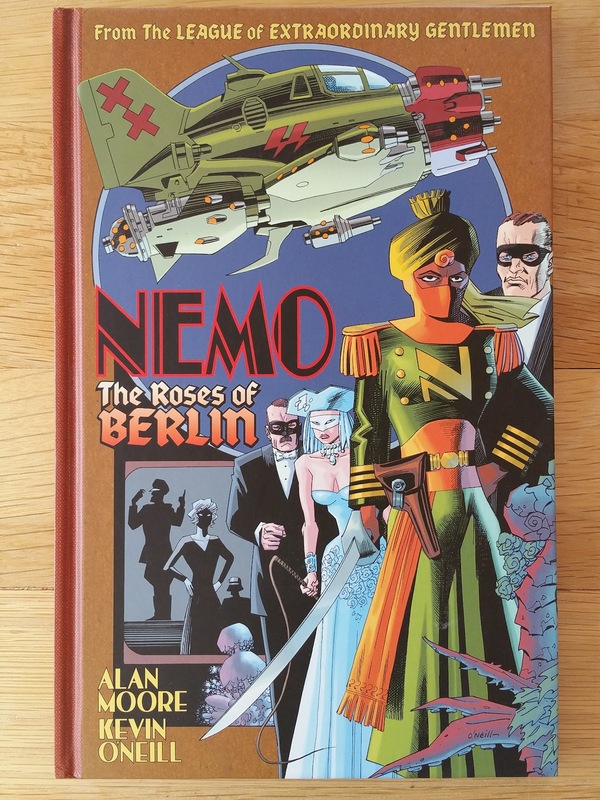 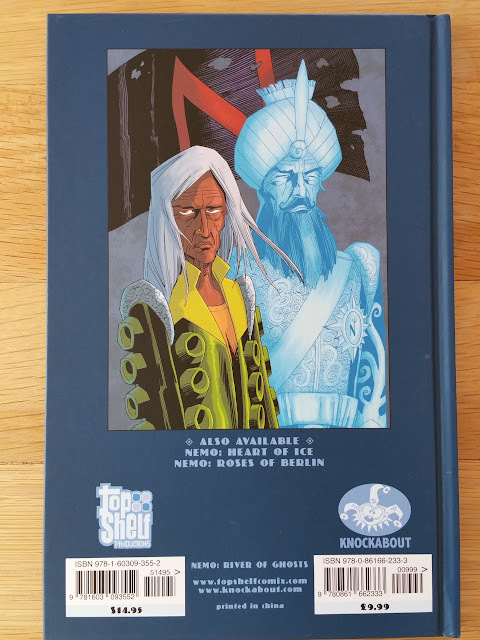 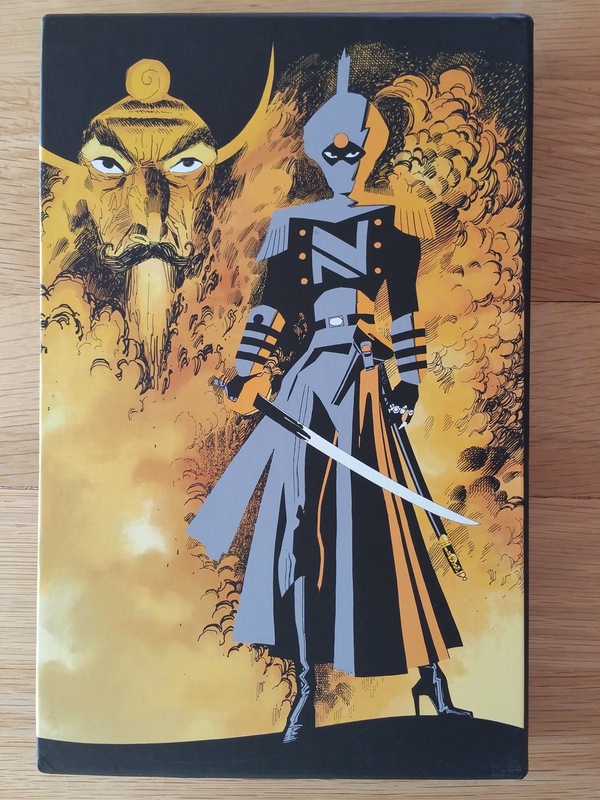 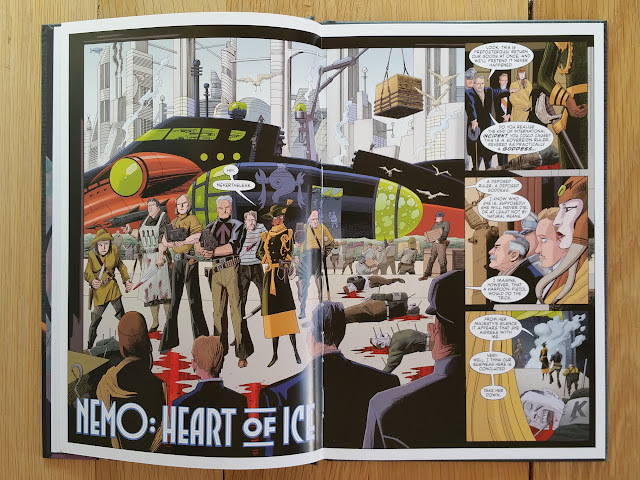 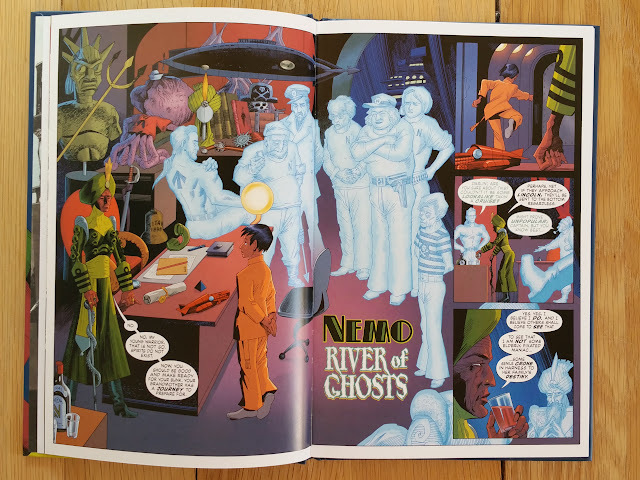 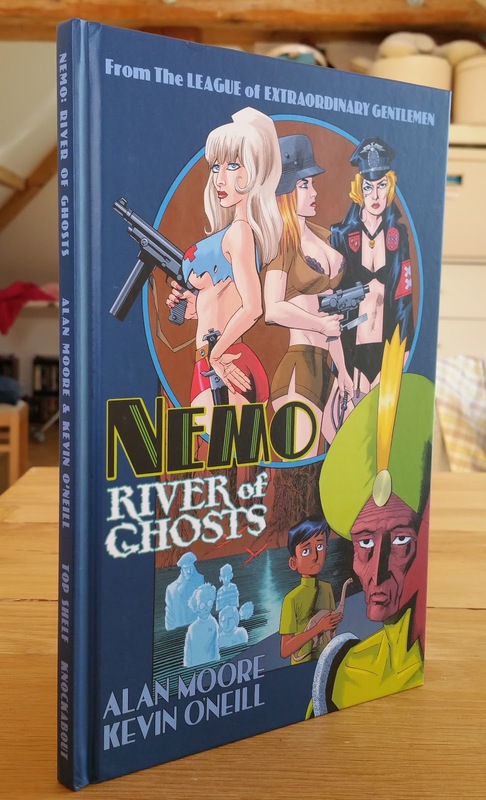 This slipcase hardcover collection of the Nemo trilogy (7 x 11 inches or 18 x 28 cm for the outer slipcase, 3 x 56 pages ) probably designed by Todd Klein, was co-published in August 2015 by Top Shelf (ISBN: 978-1-60309-381-1, cover price $39.99) and Knockabout Comics (ISBN: 978-0-86166-247-0, cover price £26.99). 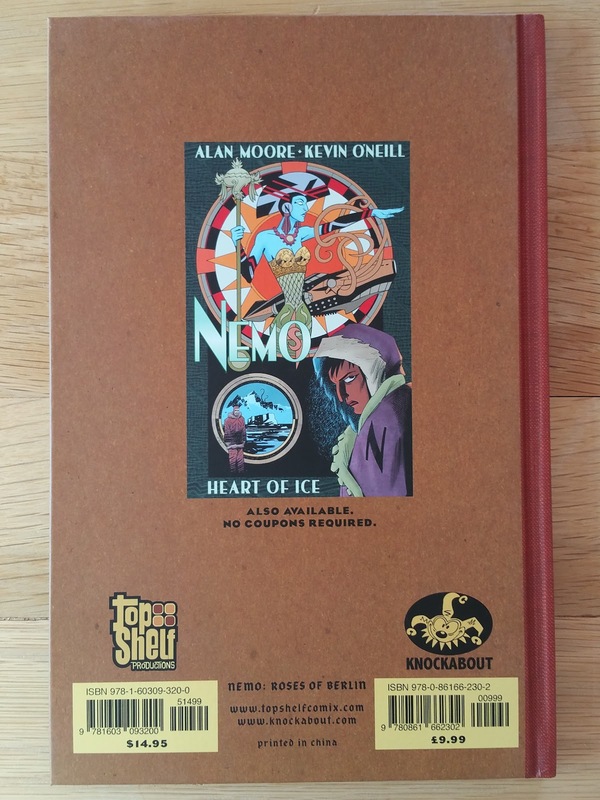 Although it seems that this edition was only issued in the USA, Gosh! London comics shop have been able to sell signed version of it. 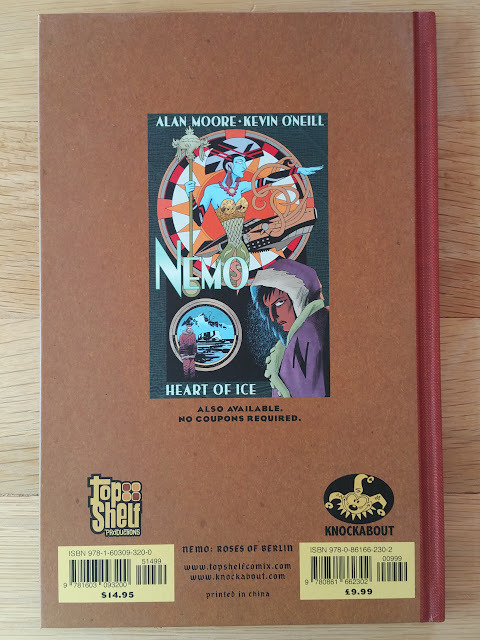 The slipcase features two new illustrations by Kevin O'Neill, and by nature, these are the only exclusive new material. 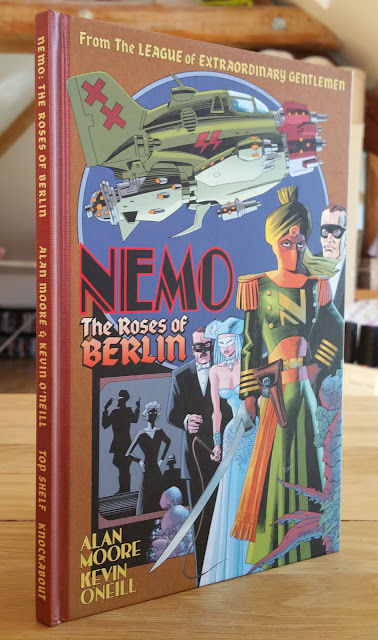 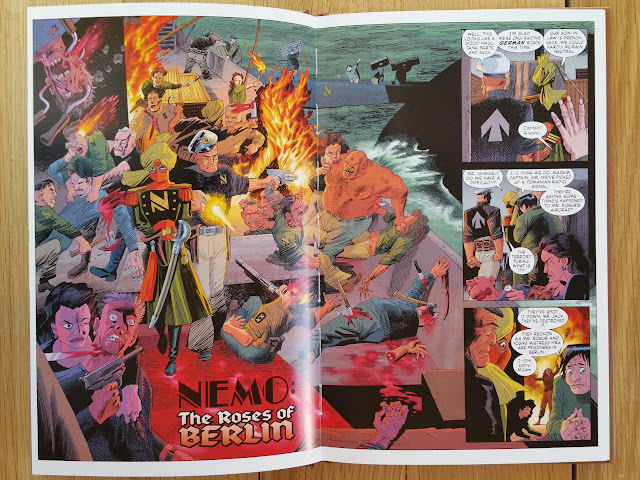 Below there is a picture for size comparison with a previous LOEG comics, and another of the Roses of Berlin binding (sewn and glued). 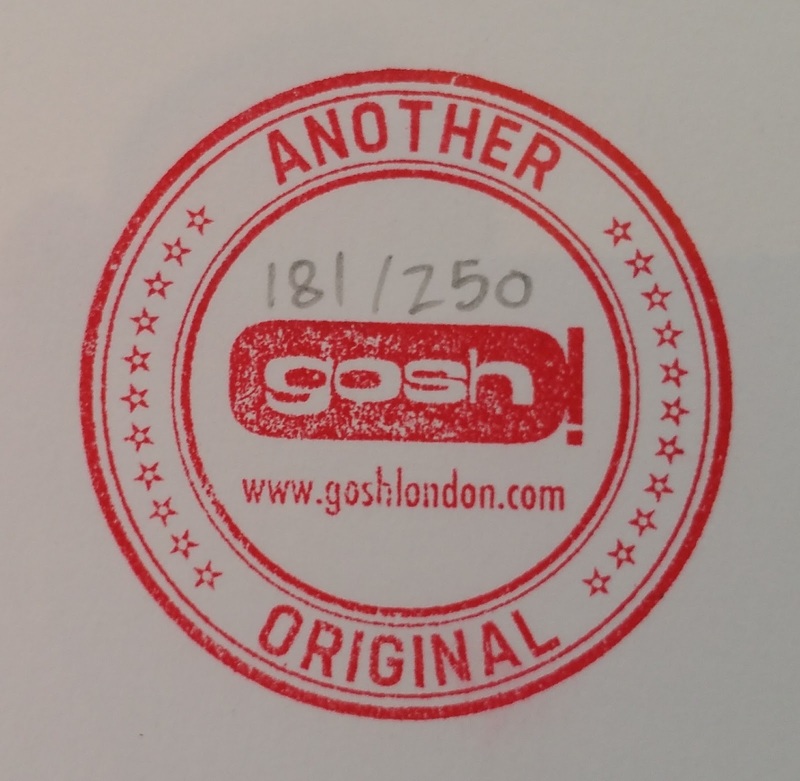 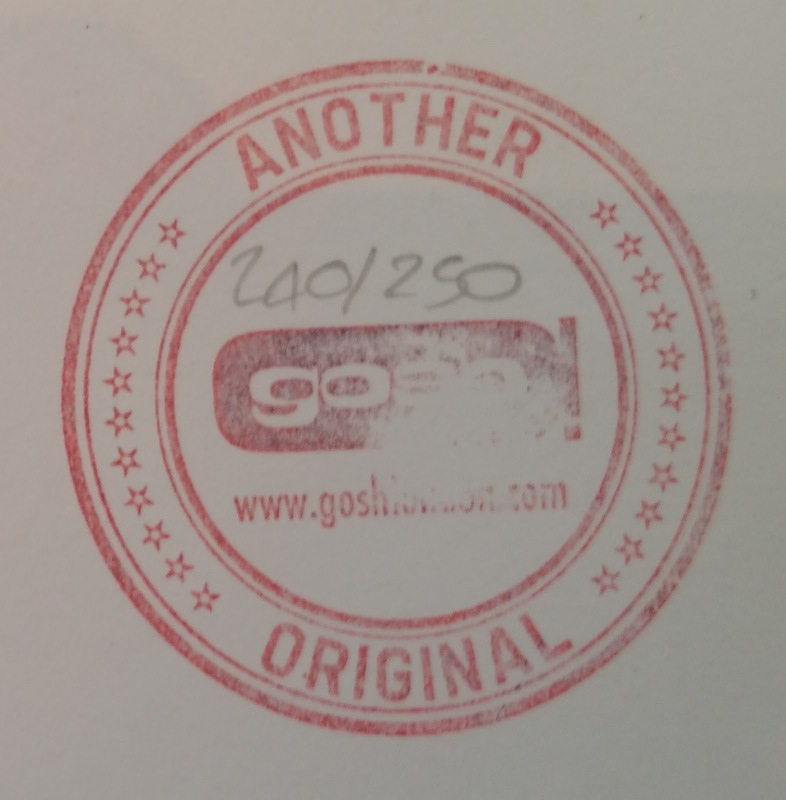 I don't own the Gosh! signed slipcase version, but as I had previously purchased all three signed hardcover through their web store, I can live with that (almost)! 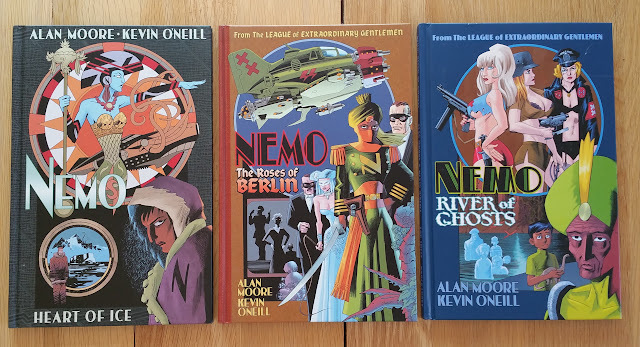 And yes, it means that I have a complete spare set (without slipcase) of that trilogy. Notice that all hardcovers (the ones from the slipcase and those I have purchased earlier) originate from the first (and only?) 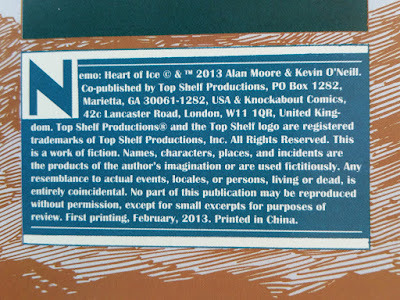 print. 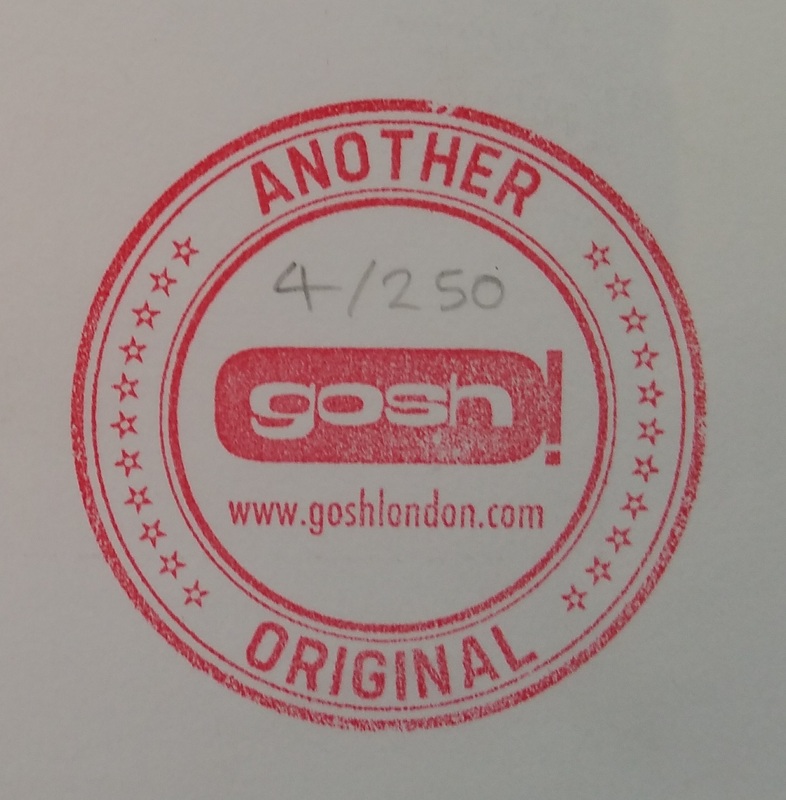 Now let's take a look at each hardcover (10.5 x 7 inches or 26.5 x 17.5 cm) that I have bought individually through Gosh! 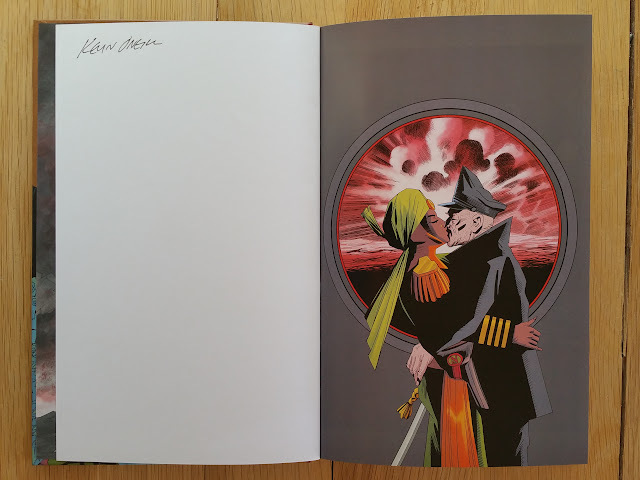 (identical to the ones put in the slipcase). 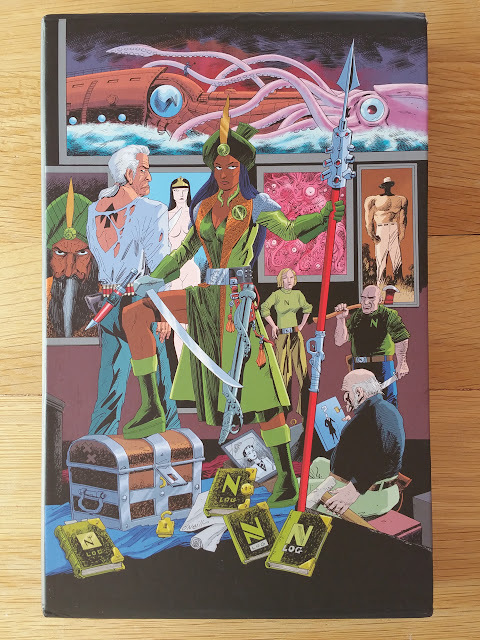 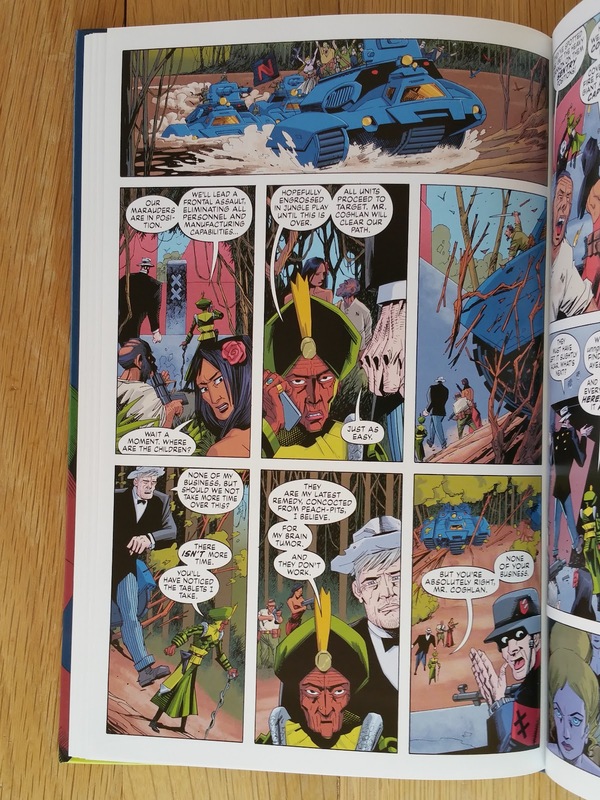 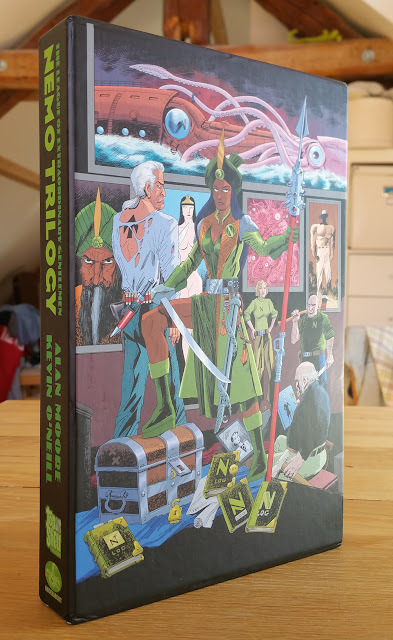 Originally published in February 2013 (see image above for ISBN and cover price), my copy has been signed by Alan Moore and Kevin O'Neill during an event hosted by Gosh! in their London shop (9th March 2016). 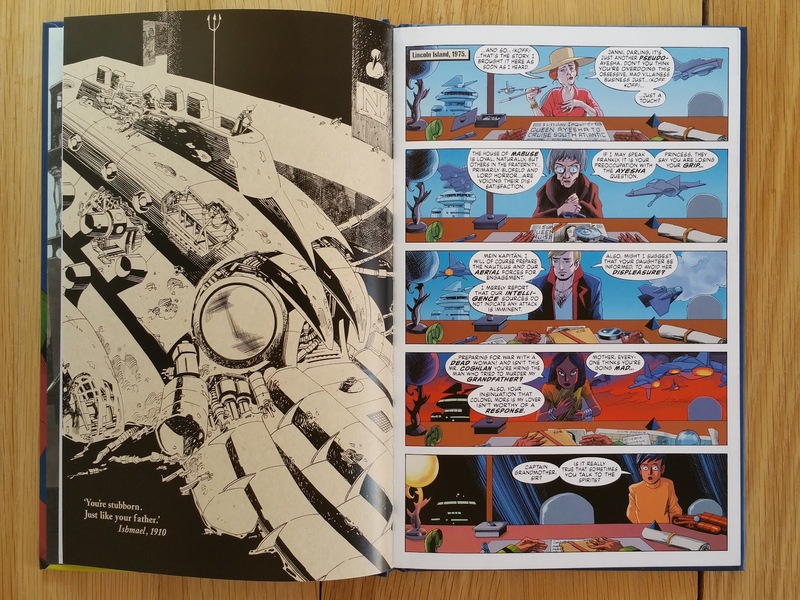 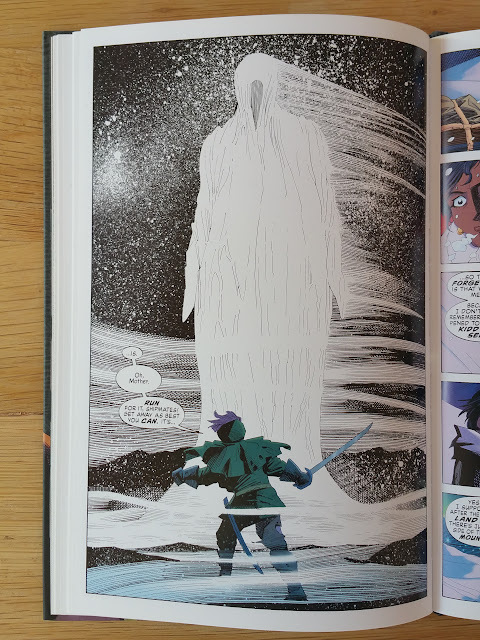 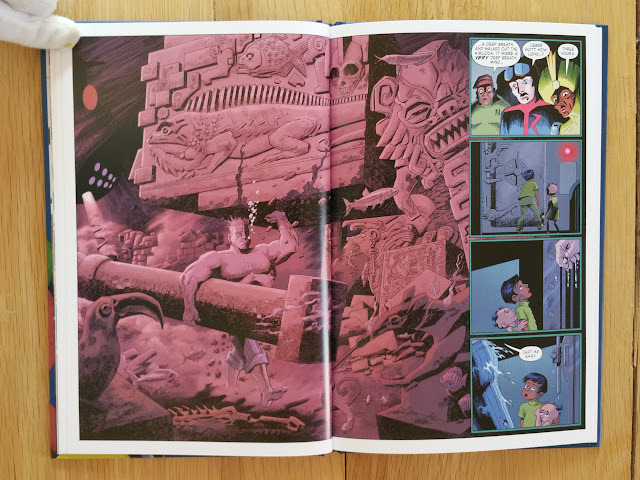 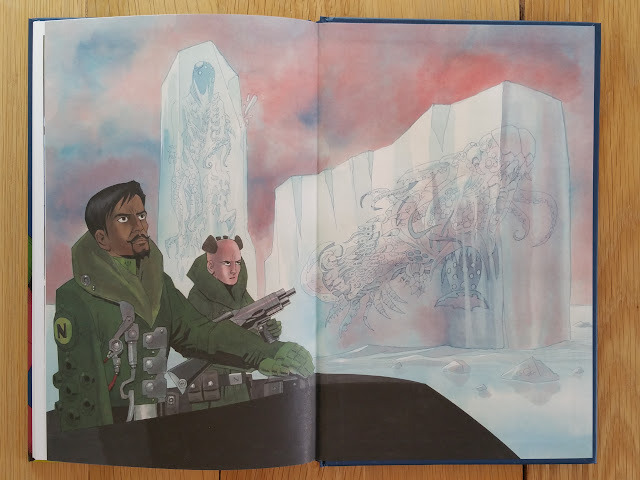 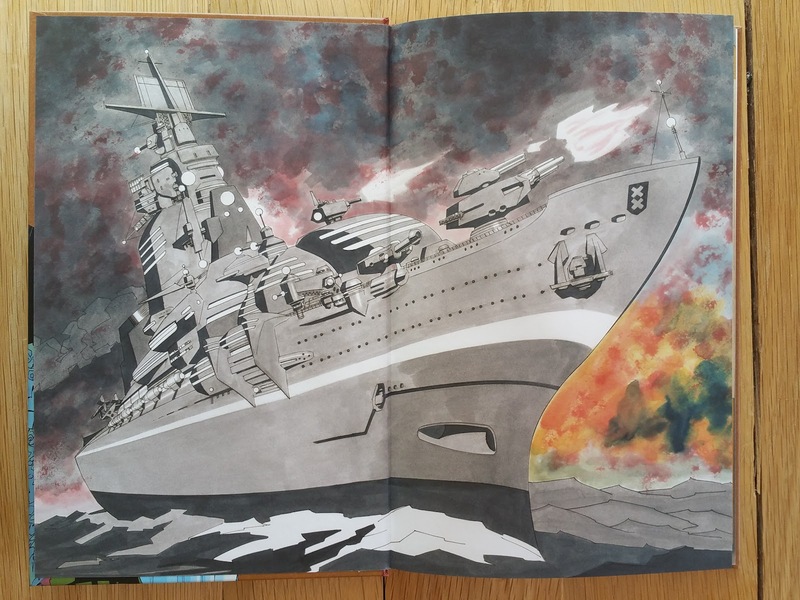 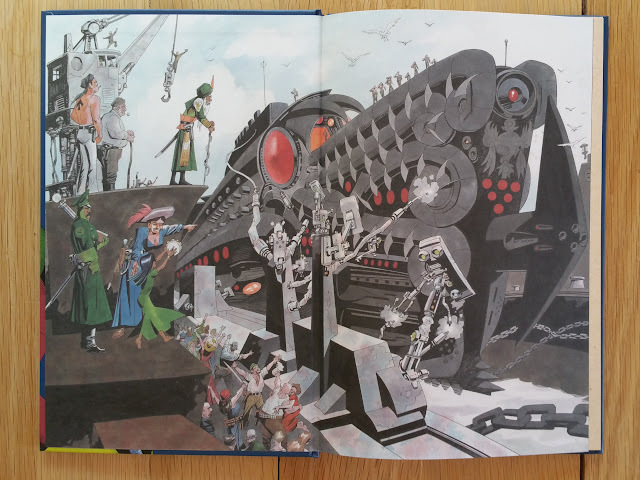 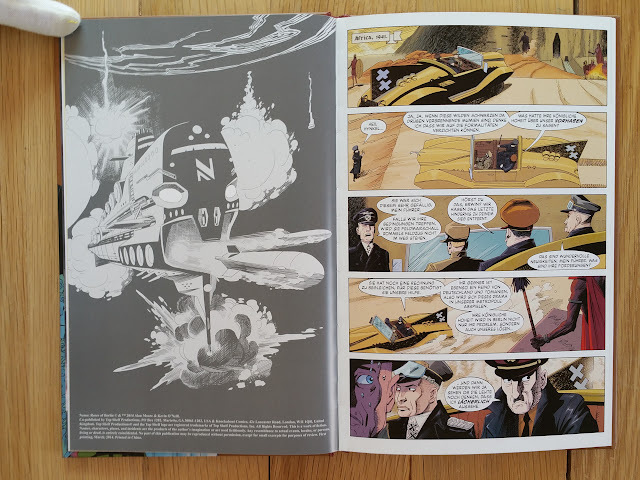 It comes with fully illustrated second and third of cover (different illustrations), and slightly glossy paper. 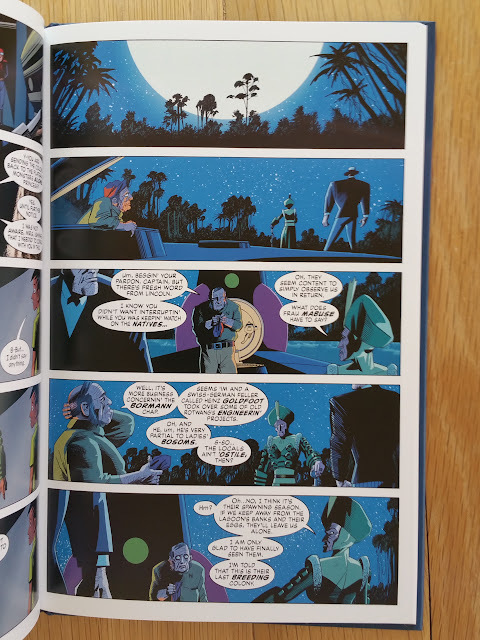 As usual I won't detailed information about the story (48 pages), but don't hesitate to do a double reading with Jess Nevins (and pals) annotations here. 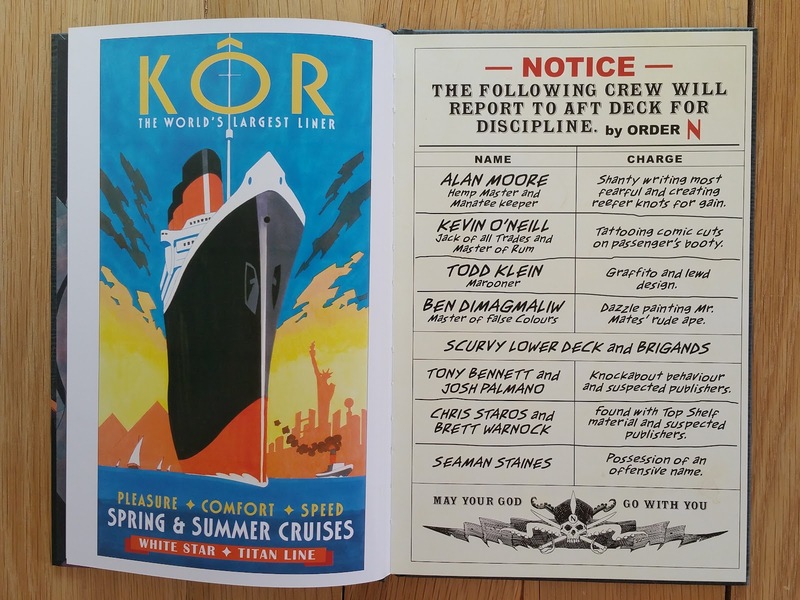 This first hardcover ends with four illustrated text pages spoofing vintage magazine article. 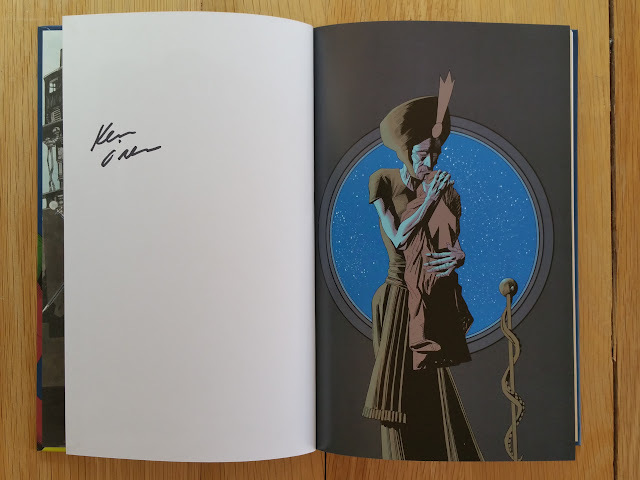 Originally published in March 2014 (see image above for ISBN and cover price), my copy has been signed by Kevin O'Neill during an event hosted by Gosh! 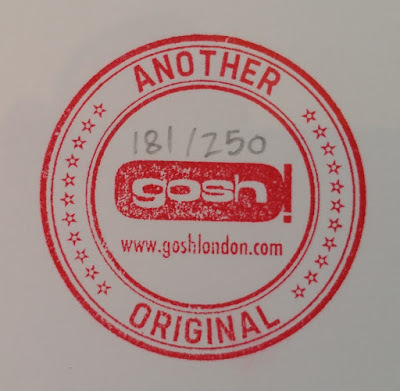 in their London shop. 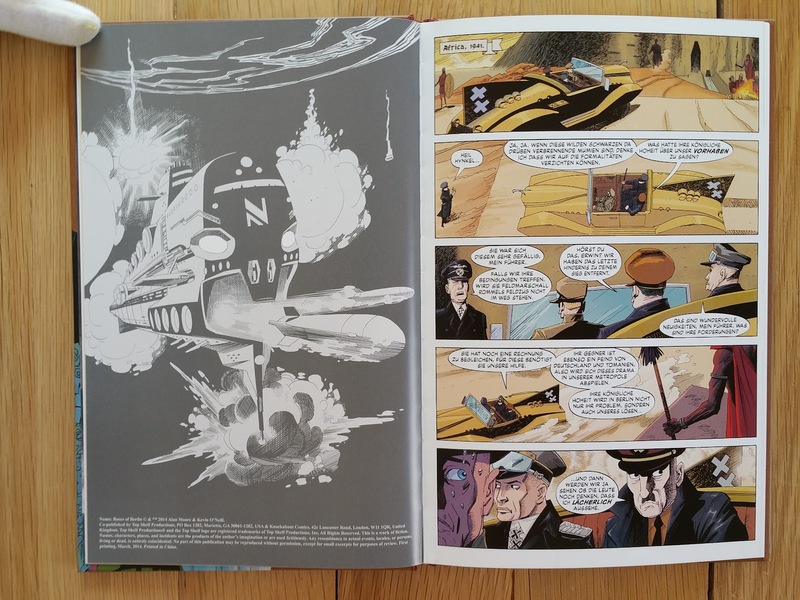 It comes with fully illustrated second and third of cover (different illustrations), and slightly glossy paper. 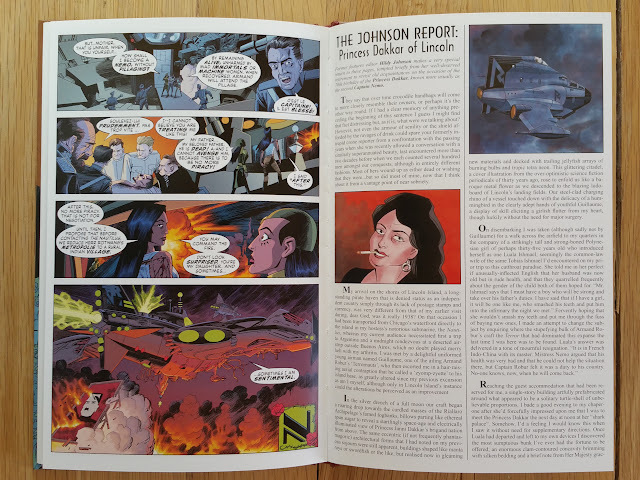 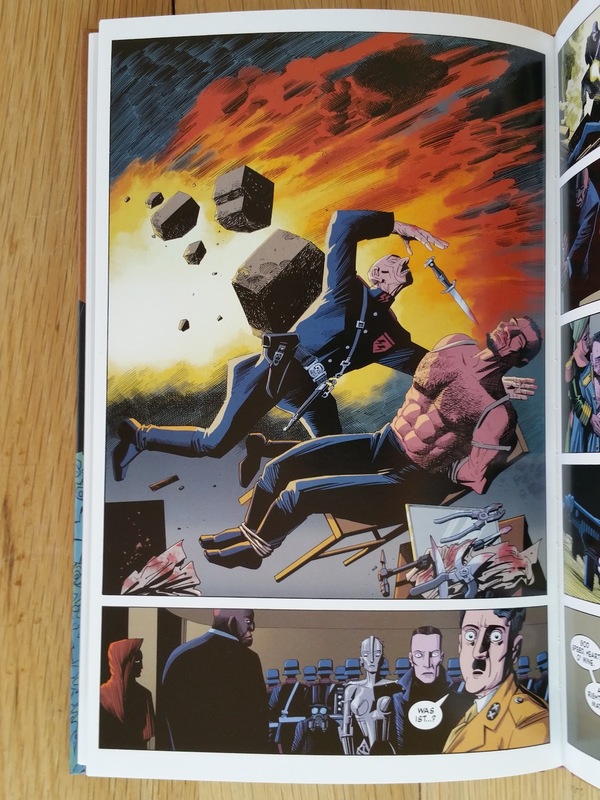 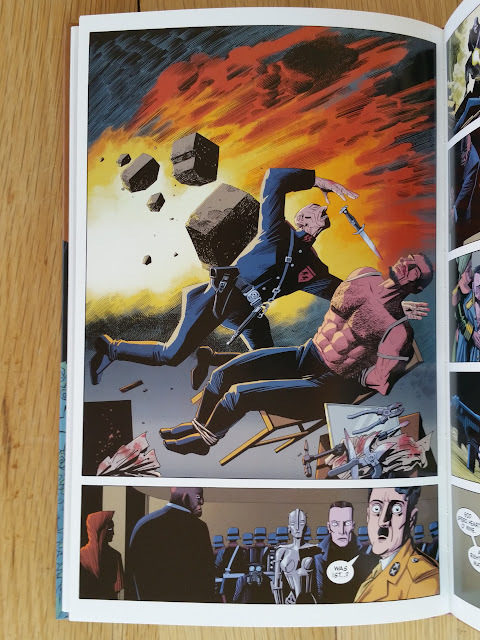 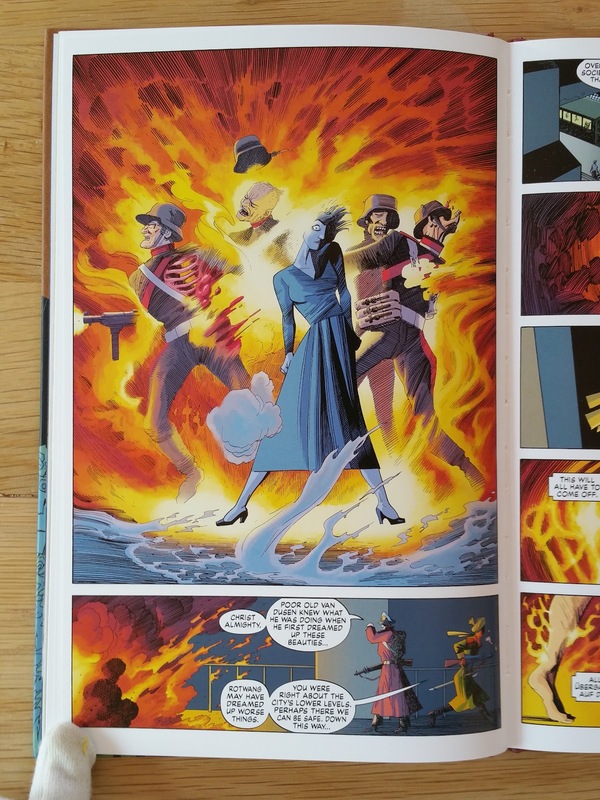 This second story is also 48 pages long, and is fully annotated by Jess Nevins (and pals) here. 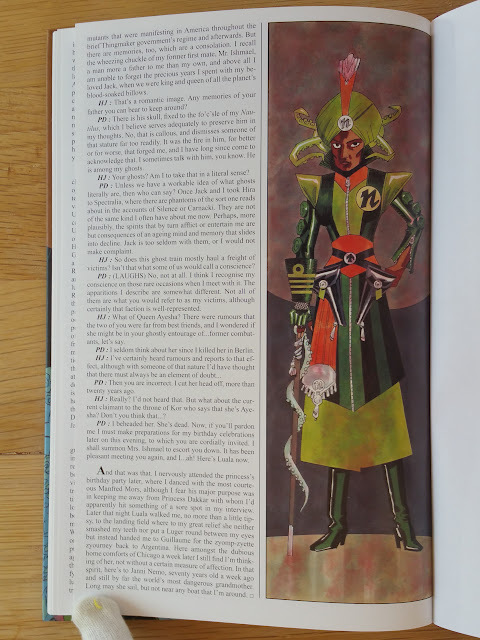 Again, this second hardcover ends with four illustrated text pages spoofing vintage magazine article. 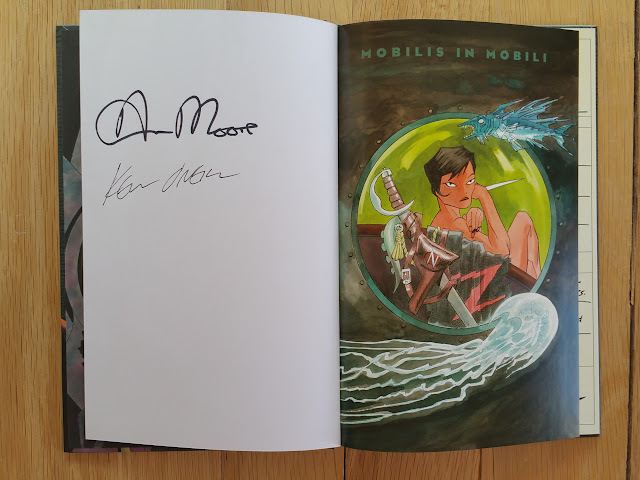 Originally published in March 2015 (see image above for ISBN and cover price), my copy has been signed by Kevin O'Neill during an event hosted by Gosh! 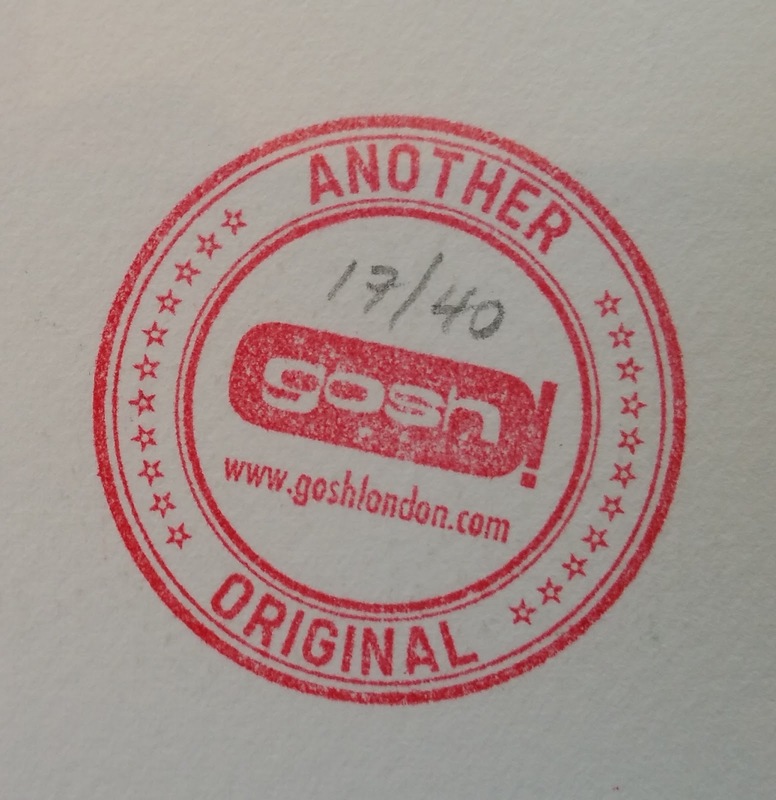 in their London shop. It comes with fully illustrated second and third of cover (different illustrations), and slightly glossy paper. 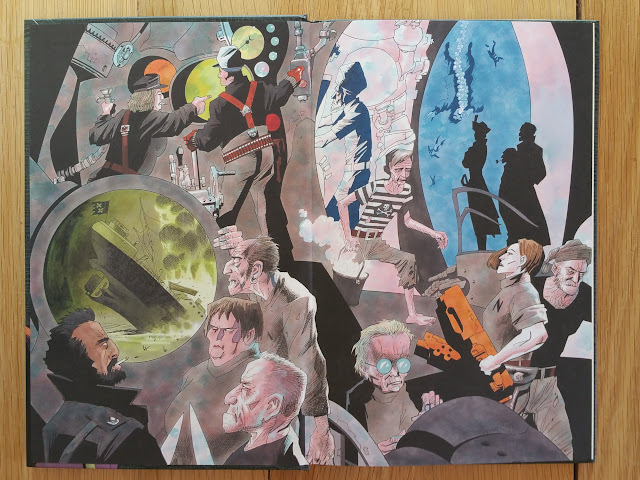 For that third installment, the story is 52 pages long, without illustrated text. 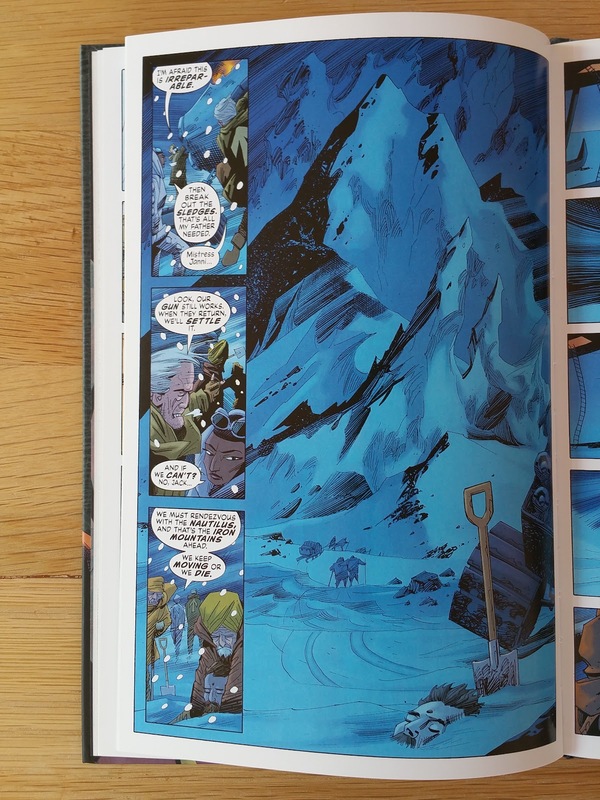 And don't forget the indispensable annotations by by Jess Nevins (and pals) here. 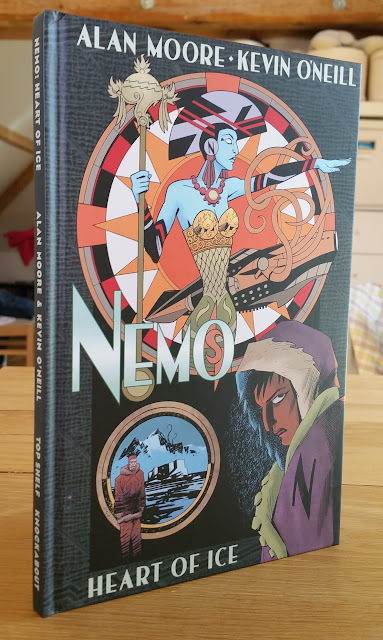 In addition to that slipcase edition, I will present here the three Nemo Trilogy A3 four colours screenprints produced by Gosh! 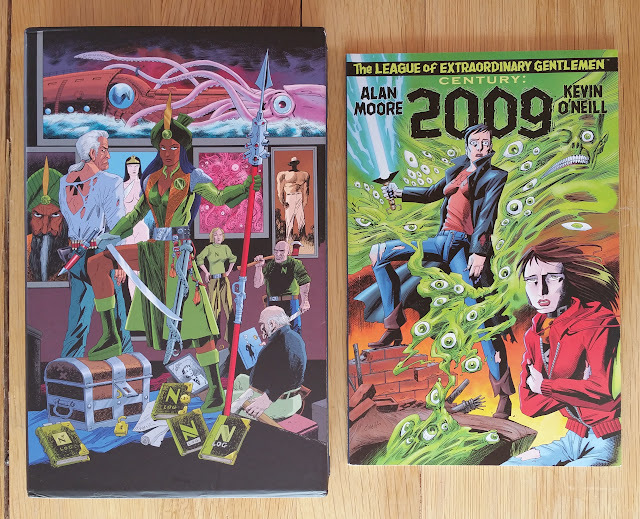 alongside the original publication of each hardcover (they were originally not framed, I have to thanks my lovely wife for that). 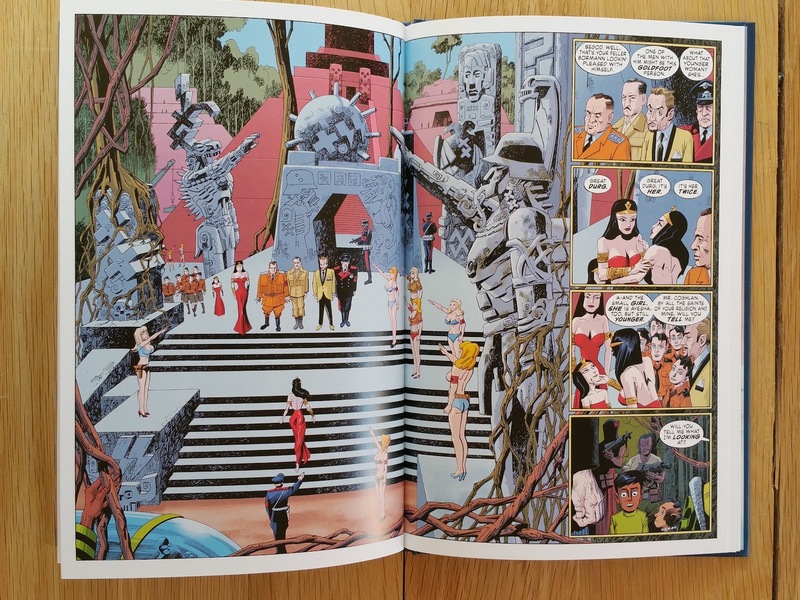 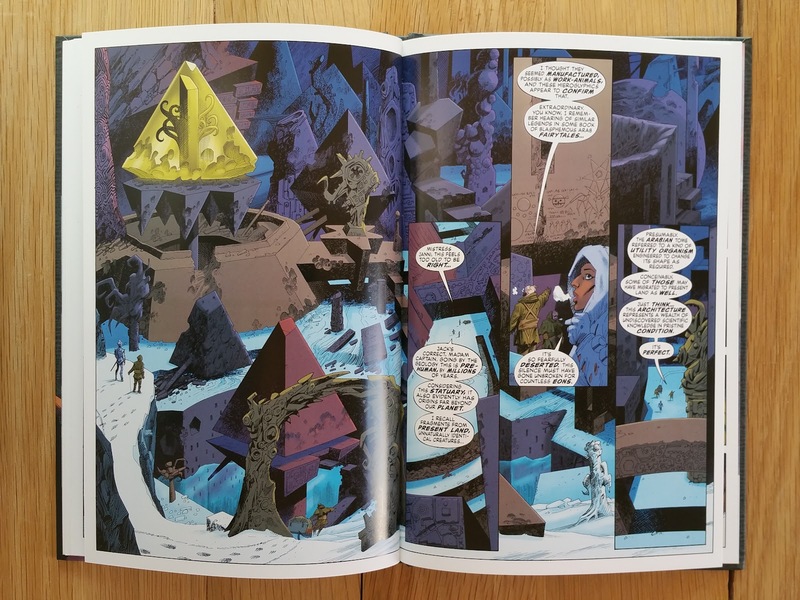 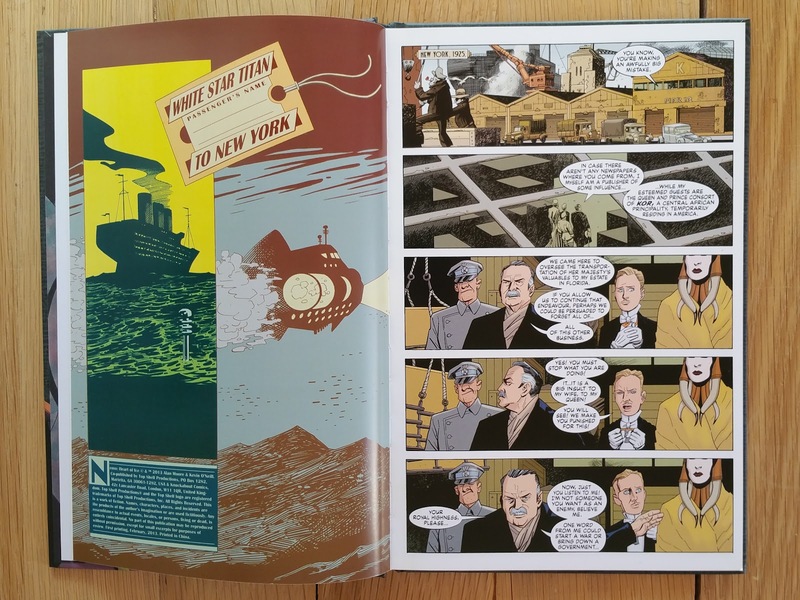 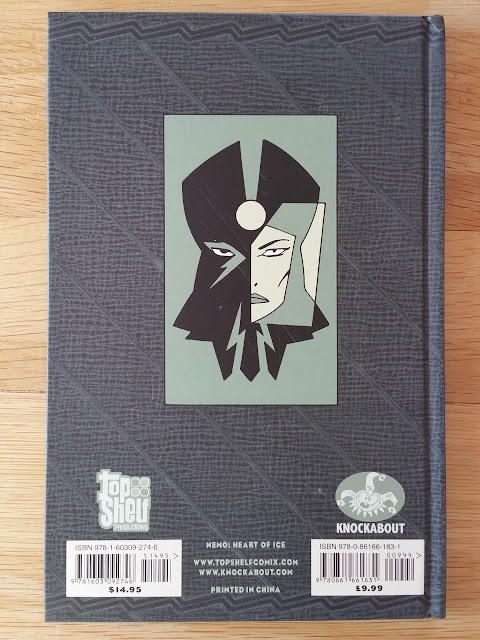 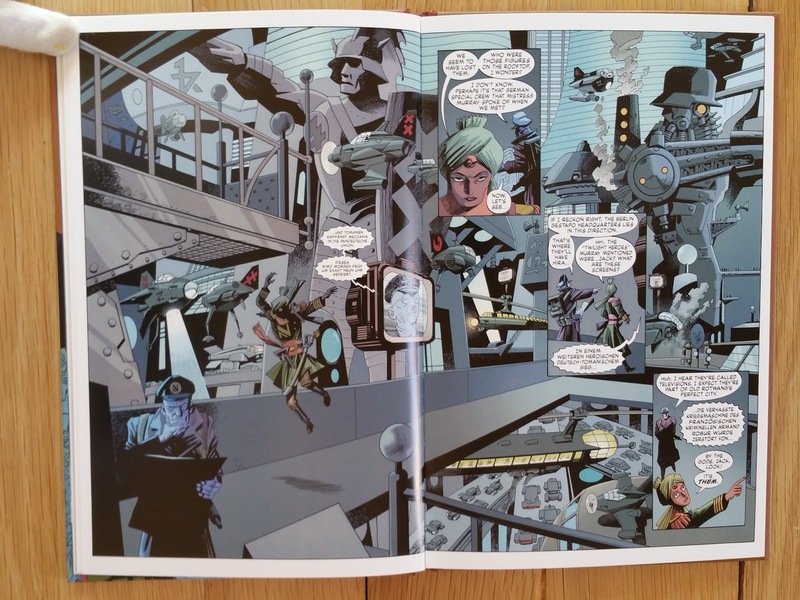 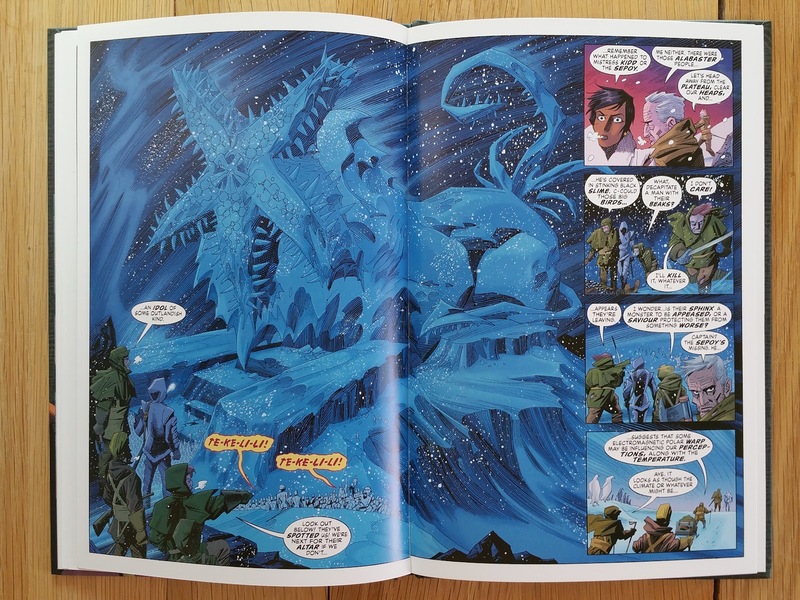 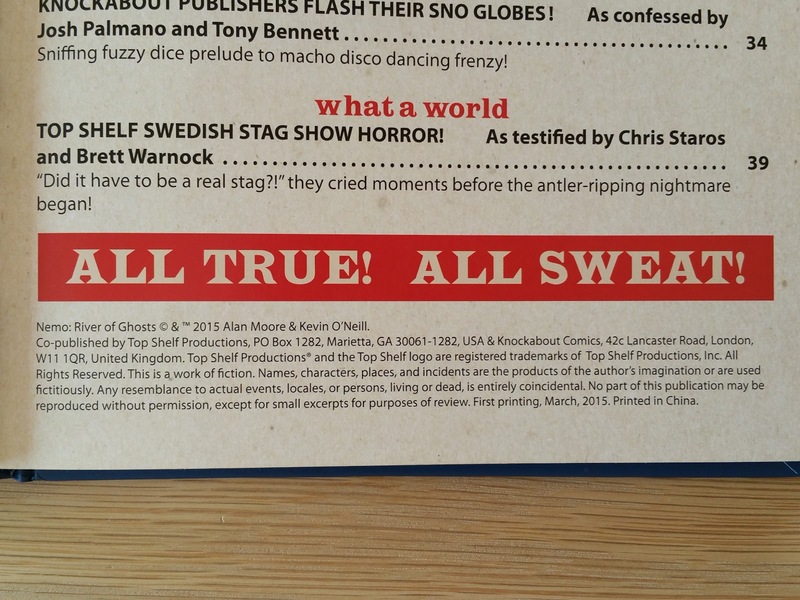 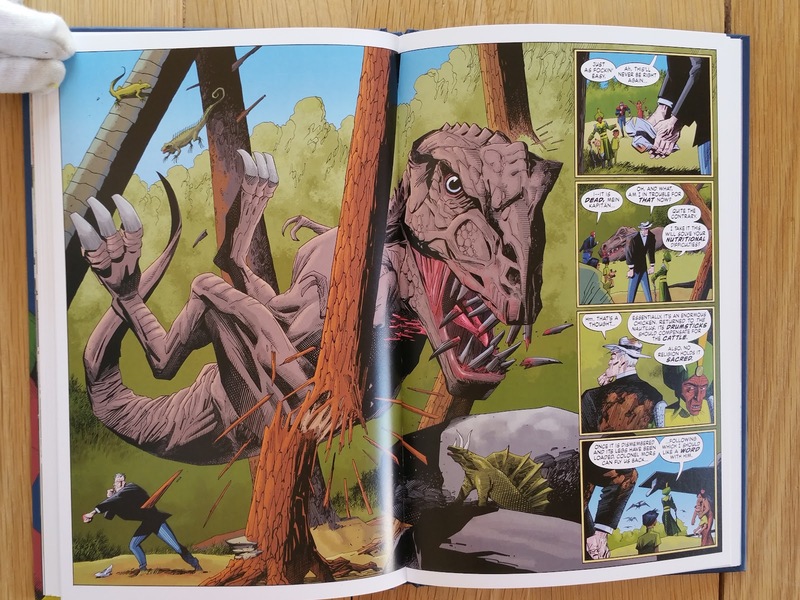 They are all limited to 250 copies and signed by both Alan Moore and Kevin O'Neill. 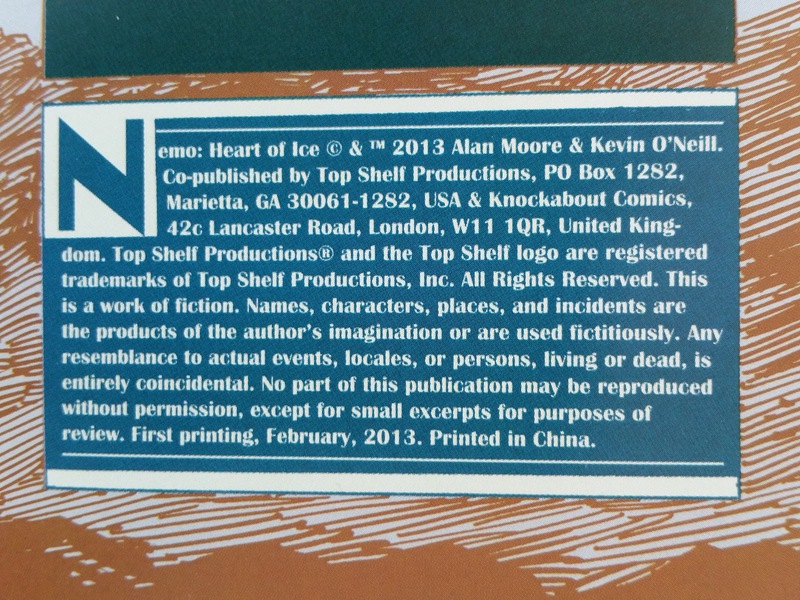 In order of appearance we have this first "art deco" Heart of Ice screeprint. 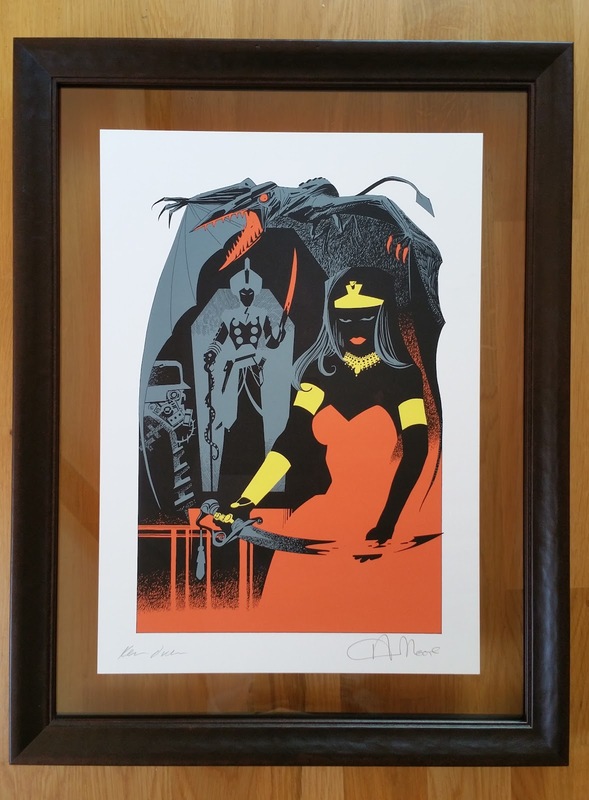 Some images of the production of this print (White Duck Screen Print) can be seen here. 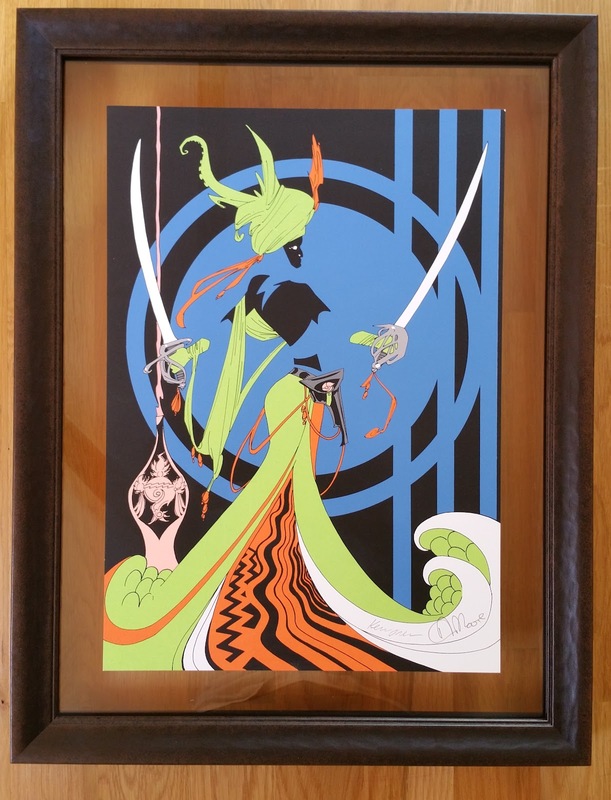 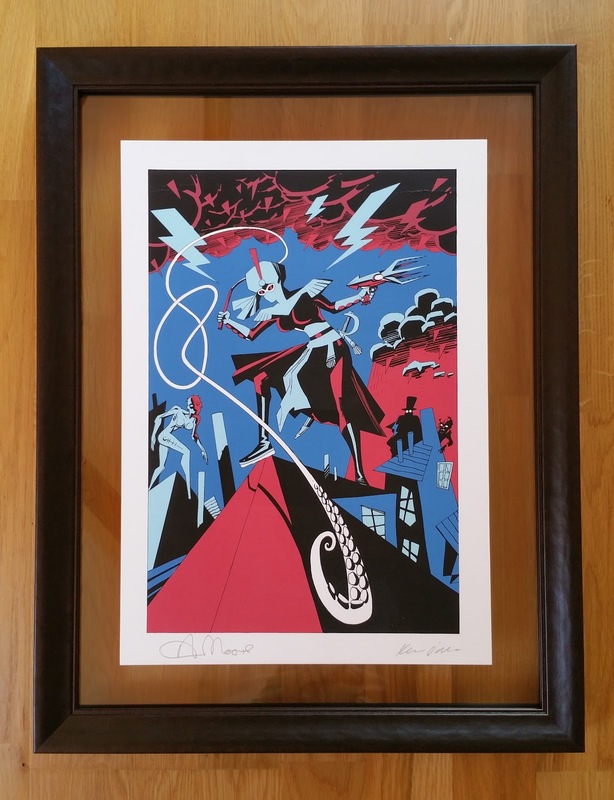 Finally, I was also able to be one of the lucky 40 people to put my hands on this A3 gyclée print signed by Kevin O'Neill, and produced in February 2014. 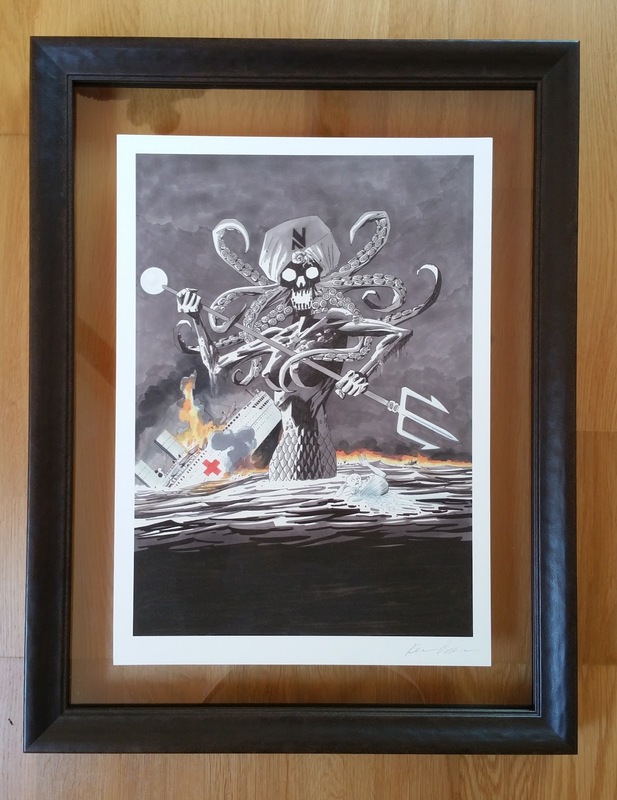 This high-quality giclée print is A3 (297mm x 420mm) in size and printed on thick, 300gsm Aquarelle rag paper. 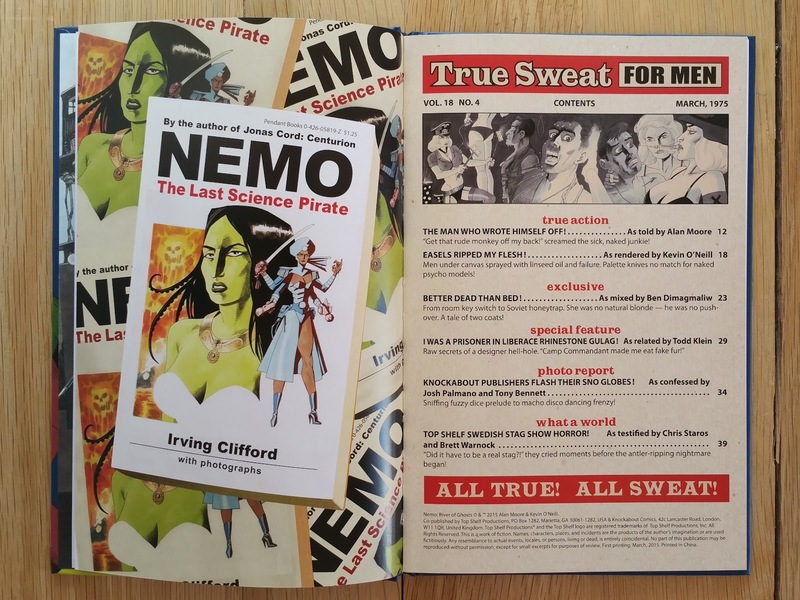 The image is taken from a splash page in the book which we loved so much that we decided to offer this print up to accompany it! 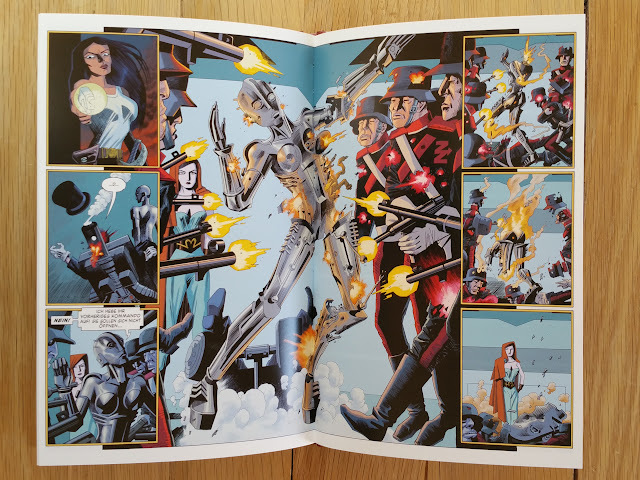 There are just 40 copies up for grabs so we’re limiting it to just one print per person.